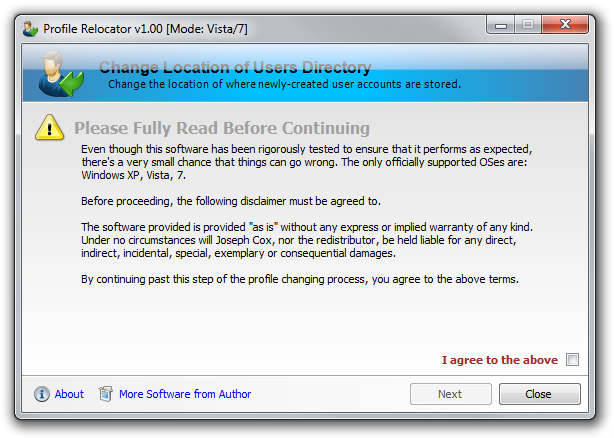 Profile Relocator is a step-based application that allows the re-locating of the Windows Users profile directory. Once re-located, any created profiles will appear in the new location in their entirety. The advantage to doing this allows profiles to be stored in a location that doesn't reside on the system drive, ensuring that profile data isn't compromised as a result of re-installation or system failure. Career Personality Profile Test toolbar to help put your career on track. Qweas is providing links to Profile Relocator 1.00 as a courtesy, and makes no representations regarding Profile Relocator or any other applications or any information related thereto. Any questions, complaints or claims regarding this application Profile Relocator 1.00 must be directed to the appropriate software vendor. You may click the publisher link of Profile Relocator on the top of this page to get more details about the vendor.